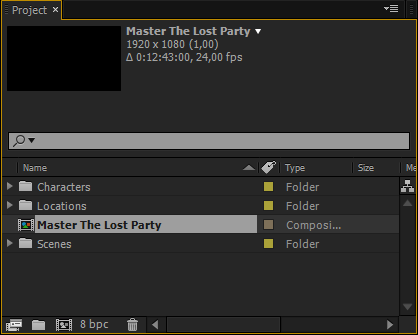 Import any screenplay right into After Effects. Use it as a context tool while working on your scene, or to create an animated storyboard, previz, animatic, and much more depending on your project pipeline. Fast & efficient, it will boost your creativity, and your pre-production pipeline. 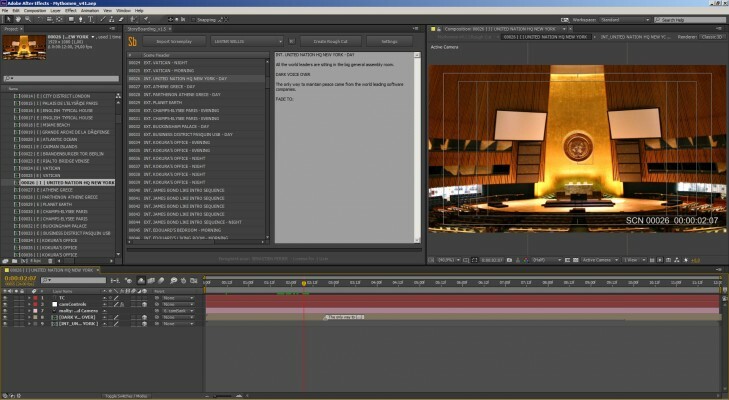 Story Boarding is an After Effects script that allows Adobe Story or Final Draft (or from any scriptwriting software exporting to the fdx format) screenplays to be imported inside Adobe After Effects. 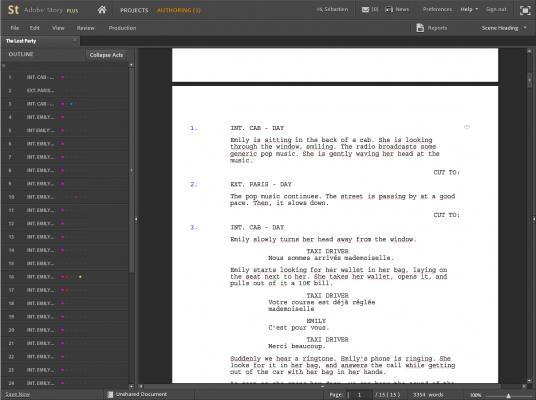 Once imported, you can use your screenplay as a context tool while working on your scene, or you can use it to create a rough cut for you and start building an animatic version of it. Better: you can use it both ways. Built as a tool to quickly iterate on the Mythomen Movie Project, it’s the perfect time saver for visually experimenting with your story to strengthen your style and your creative vision. Play around with pace, musics, camera angles, scene layout faster than ever and spend more time refining your art than manipulating complicated tools. Create a fast and animated storyboard, previz, animatic, and much more depending on your project pipeline. Story Boarding was designed to be as easy a clicking on 2 buttons. One to select your screenplay, the second to create your rough cut. Sounds easy, but what does it creates for me? Story Boarding creates for you a comp for every scene in your screenplay, properly timed. It will also create the comps for every speaking character and every location. On top of that, you get a camera and timed informations right inside the comp. Story Boarding will only create one comp for each character and location, so when you update one, it will be updated in every scene that use this character and/or location. You can create really quickly a shooting board of your movie! Cool, but can I change settings? Sure you can. 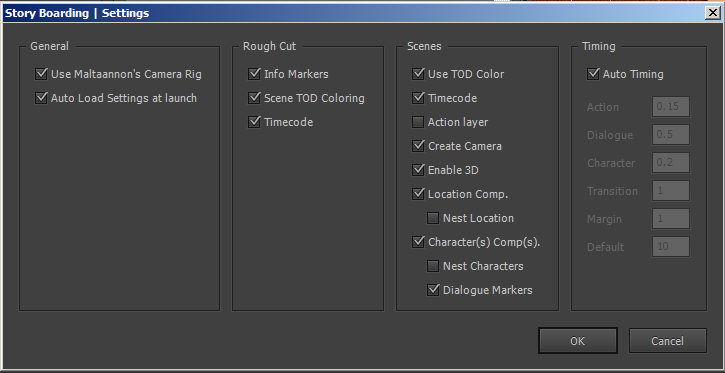 Click on the settings button, and you'll have access to all of the script settings. By default, we selected the ones we though would make more sense for everyone, but we added some cool ones you might find very useful! Cool, but what if I just want to create some of the scenes from the screenplay? Well, you can do that too. 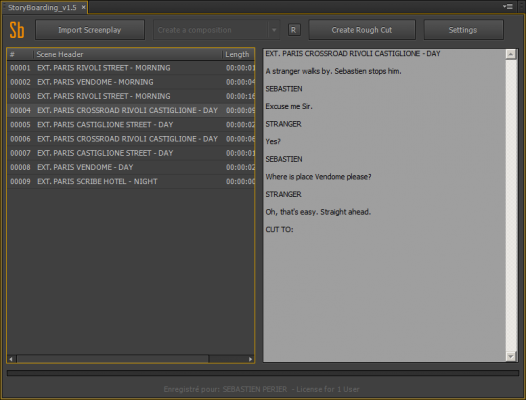 Just import your screenplay, and then double click on the scenes you want to create in the scene list. 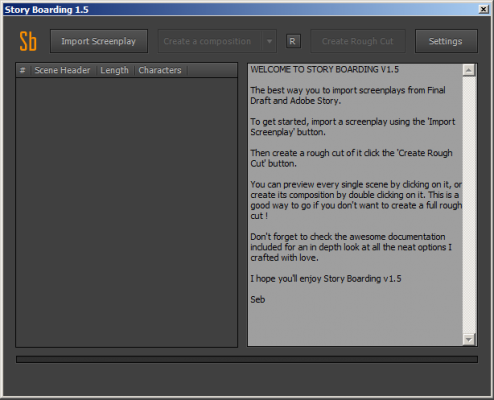 You can even use Story Boarding as a context tool, meaning that you can import the screenplay just to have the content at hand! This script was designed to help me direct my indie animated feature length movie! By purchasing it, you help me finance it, and allows me to stay indie. I promise, I won't sellout to Facebook or any company offering me big bucks. It's just about you, me and the awesome AE community!